David Tennant, Michael Sheen, and the cast of Good Omens brought a treat for fans at New York Comic Con: the first trailer for the series! Good Omens is based upon the novel by Neil Gaiman and the late Terry Pratchett. Tennant and Sheen are headlining the series as Crowley and Aziraphale, a demon and an angel, respectively. 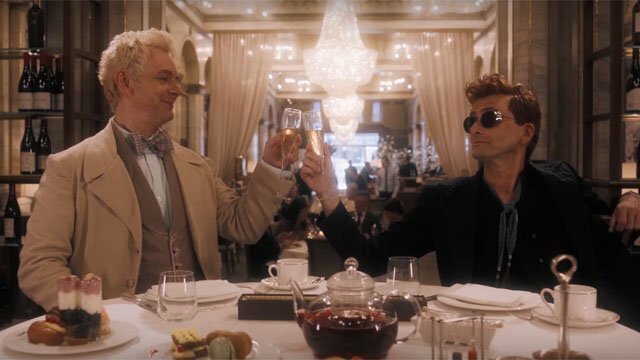 Crowley and Aziraphale have developed an odd friendship over the last 6,000 years, even though the angel denies it in the new trailer. Crowley actually takes the initiative in stopping the apocalypse, but not out of any altruism. He knows that the final battle between Heaven and Hell will destroy everything, and he quite likes living on Earth. Aziraphale feels the same way, although it appears that he will need a little extra convincing. But even with their combined efforts, the end times may have finally arrived. RELATED: The American Gods Season 2 Trailer is Here! Whoopi Goldberg hosted the NYCC Good Omens panel, which featured Tennant and Sheen with their co-stars Miranda Richardson and Jon Hamm. Gaiman was also on hand to talk about the show, but Tennant couldn’t resist shouting out that Hamm would make a great Batman. Hamm joked that he only did the series because Amazon gave him enough money to retire. But Hamm quickly admitted that he was a fan of the book, which was echoed by his co-stars. A scene from the second episode was also shown, but it’s not currently online. You can catch the first trailer below. Good Omens will run for six-episodes, and it is expected to premiere in early 2019 on Amazon Prime. What do you think about the new trailer? Let us know in the comment section below!